The DANA Power Supply Advantage! Very High Quality Linear P.S. For over 20 years DANA S.r.l.. has been involved in the Energy Conversion sector and has faced and solved countless problems linked to Energy Conversion and Power Management. In the field of Direct Current, DANA has engineered and manufactured Power Supplies for multiple uses ranging from battery charge to diesel engines starting, for testing filament lamps and for use medical in Nuclear Magnetic Resonance magnets charge. The fact that DANA designs and produces very fast Power Supplies makes DANA Power Supplies perfect for applications such as EMC testing to testing solar inverters. In the field of D/C - Direct Current, DANA builds bidirectional electronic switches that are ultra compact size and weight, but are able to convert power up to 80kW. DANA S.r.l.. is particularly well known and appreciated by Direct Current users because of its Power Supplies high speed response to remote control units as well as for the ease in employing its equipment. 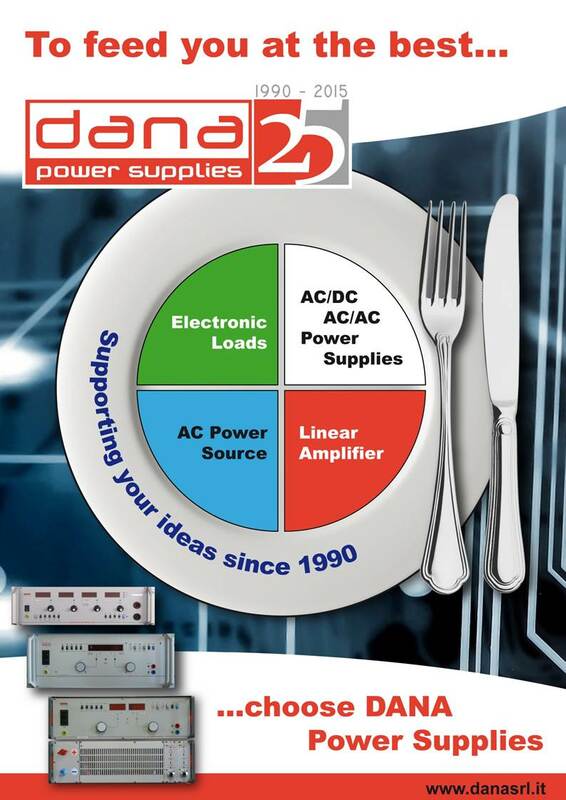 DANA offers AC Power Sources with output frequency up to 400Hz or Electronic Loads for A/C alternate current or Bipolar 2 - 4 Quadrants Power Supplies for special purposes like for superconductors test. With more than 321 types of AC/DC Power Supplies, Electronic Loads, Amplifiers and AC Sources, it is always possible to find a DANA product for your power requirements. In-addition to the standard product line, DANA can produce customer specific Power Supplies, Electronic Load, Amplifiers and AC Sources up to 40 KW power, thereby offering an almost infinite possibility of solutions. DANA S.r.l.. guarantee its products for 36 months from the delivery date. All DANA Power Supplies come standard with a 3 Year Warranty!